What Other Heart Attack Treatment Options Are There? More than 1 million Americans have heart attacks each year. A heart attack, or myocardial infarction (MI), is an event that causes permanent damage to the heart muscle. "Myo" means muscle, "cardial" refers to the heart and "infarction" means death of muscle tissue due to lack of blood and oxygen supply. Heart muscle requires a constant supply of oxygen-rich blood to nourish it. The coronary arteries provide the heart with this critical blood supply. If you have coronary artery disease, those arteries become narrow -- or obstructed -- and blood cannot flow as well as it should. Fatty matter, calcium, proteins and inflammatory cells build up within the arteries to form plaques of different sizes and consistencies. 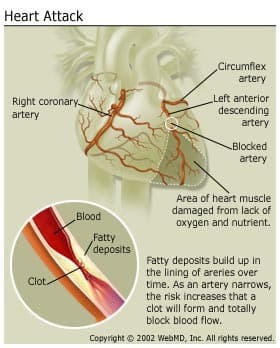 This is sometimes what causes the initial symptoms of coronary artery disease. With the build-up of plaque, there is less delivery of oxygen to the heart muscle, especially when there is a demand for oxygen (during exertion or exercise) and chest pain or symptoms can develop. The outer surface of the plaque may rupture or crack and platelets (disc-shaped particles in the blood that help form blood clots) then come to the area to form blood clots around the plaque -- like a scab. If a blood clot totally obstructs the artery, the heart muscle can become starved for oxygen. This is called ischemia. And within a short time (even minutes), death of heart muscle cells occurs, causing permanent damage. This is a heart attack. While it is unusual, a heart attack can also be caused by a spasm of a coronary artery. Coronary arteries have a muscle lining which can contract or relax depending on the needs of the heart muscle at a given time. During a coronary spasm, the coronary arteries constrict or spasm without warning, reducing blood supply to the heart muscle and potentially causing a heart attack. It may occur at rest and can even occur in people without significant coronary artery disease. Each coronary artery supplies blood to a specific region of heart muscle. The amount of damage to the heart muscle depends on the size of the area supplied by the blocked artery and the time between injury and treatment. Earlier treatment can reduce the impact of the heart attack. Healing of the heart muscle begins soon after a heart attack and takes about eight weeks. Similar to a skin wound, the heart's wound heals and a scar will form in the damaged area. However, the new scar tissue does not contract. Therefore, the heart's pumping ability can be reduced after a heart attack. The amount of lost pumping ability depends on the size and location of the scar. During a heart attack, symptoms may last 30 minutes or longer and are not relieved by rest or nitroglycerin. Some people have a heart attack without having any symptoms (a "silent" myocardial infarction). A silent MI can occur in anyone, though it is more common among diabetics. After a heart attack, quick treatment to open the blocked artery is essential to decrease the amount of damage. At the first signs of a heart attack, call for emergency treatment (usually 911). Waiting before treatment increases the risk of damage to your heart and also reduces your chance of survival. Keep in mind that chest discomfort can be described many ways. It can occur in the chest or in the arms, back or jaw. If you have any of these symptoms, take them seriously. Seek medical care immediately. To diagnose a heart attack, an emergency care team will ask you about your symptoms and begin to evaluate you. The diagnosis of the heart attack is based on your symptoms as well as your test results. The goal of treatment is to treat you quickly and limit heart muscle damage. Electrocardiogram. The electrocardiogram (ECG or EKG) can provide information about the extent and location of heart muscle damage. It also detects your heart rate and rhythm. whether or not you are having a heart attack. Blood tests. Blood may be drawn to measure levels of cardiac enzymes that indicate heart muscle damage. These enzymes are normally found inside the cells of your heart and are needed for their function. When your heart muscle cells are injured, their contents -- including the enzymes -- are released into the bloodstream. By measuring the levels of these enzymes, the doctor can determine approximately when the heart attack started. Echocardiography. An echocardiogram (also called an echo) is an ultrasound test that can be used to learn how the heart is pumping overall and what areas might not be pumping normally. The echo can also determine if any structures of the heart (such as the valves and septum) have been injured during the heart attack. Cardiac catheterization. Cardiac catheterization, also called a cardiac cath or an angiogram, is an invasive test performed to directly visualize (using X-rays) the size and extent of blockage in the coronary arteries. It is frequently recommended in the first hours of a heart attack if medications are not relieving the ischemia or symptoms. The cardiac catheterization can be used to help your doctor determine which procedure is needed to treat the blockage. Balloon angioplasty, coronary stenting, and coronary artery bypass surgery may be recommended in addition to medications. Once a heart attack is diagnosed, treatment begins immediately -- possibly in the ambulance or emergency room. Drugs, catheter-based procedures, and surgery are used to treat a heart attack. The goals of drug therapy are to break up or prevent blood clots, prevent platelets from gathering and sticking to the plaque, stabilize the plaque, and prevent further damage. These medications must be given as soon as possible to decrease the amount of heart damage. The longer the delay in starting these drugs, the more damage can occur and the less benefit they can provide. Thrombolytic therapy ("clot busters") to dissolve blood clots that are present in the heart's arteries. Other drugs, given during or after a heart attack, lessen your heart's workload, improve the functioning of the heart, widen or dilate your blood vessels, decrease your pain, and guard against any life-threatening heart rhythms. During or shortly after a heart attack, you may go to the cardiac catheterization lab for direct evaluation of the status of your heart, arteries, and the amount of heart damage. In some cases, procedures (such as balloon angioplasty or stents) are used to open up your narrowed or blocked arteries. These procedures may be combined with thrombolytic therapy (drug treatments) to open up the narrowed arteries, as well as to break up any clots that are blocking them. The goal after a heart attack is to keep the heart healthy and reduce the risks of having another heart attack. Your best opportunities to ward off future attacks is to take your medications, change your lifestyle, and see your doctor for regular heart checkups. Lessen the heart's workload and improve its performance and recovery. Limit plaques by lowering cholesterol. Other drugs may be prescribed if needed. These include medications to treat irregular heartbeats, lower blood pressure, control chest pain, and treat heart failure. It is important to know the names of your medications, what they are used for, and how often and at what times you need to take them. Your doctor or nurse should review your medications with you. Keep a list of your medications and bring them to each of your doctor visits. If you have questions, ask your doctor or pharmacist. There is no cure for coronary artery disease. In order to prevent the progression of this disease, you must follow your doctor's advice and make necessary lifestyle changes. You can stop smoking, treat your blood cholesterol, control your diabetes and high blood pressure, follow an exercise plan, maintain an ideal body weight, and control stress. It is also important to start a heart healthy diet. Make a doctor's appointment for two to six weeks after leaving the hospital. Your doctor will want to check the progress of your recovery. She may ask you to undergo diagnostic tests (such as an exercise stress test or echocardiogram at regular intervals). These tests can help your doctor diagnose the presence or progression of blockages in your coronary arteries and plan treatment. Call your doctor sooner if you have symptoms such as chest pain, shortness of breath -- especially at rest, dizziness, or irregular heartbeats.